My Future Radio programme at 5.00pm UK time on Sunday November 25 has an all American theme for the Thanksgiving Holiday, but with an East Anglian twist. Aaron Copland’s first set of Old American Songs was commissioned by Benjamin Britten and Peter Pears for the 1951 Aldeburgh Festival here in East Anglia. There are five songs in the set, and the fourth is the traditional Shaker tune Simple Gifts, and that melody appears in different guises in all the works in the programme. I am playing Susan Chilcott's performance of the Old American Songs accompanied pianist Iain Burnside. Tragically Susan Chilcott died of cancer at the age of 40 just a year after this recording was made. Simple Gifts has appeared in many different versions over the years, including one by Wilson Picket. But for the central sequence of the programme I'm going back to the song in its original version. It is sung by the Shakers of Sabbathday Lake in Maine augmented by the Schola Cantorum, Boston in a sequence of five Shaker chants and spirituals. The recording I am playing is a real find, read about it here. For the final music in the programme I turn to one of the most celebrated re-imaginings of Simple Gifts. 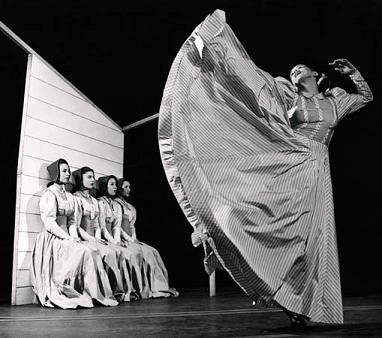 Aaron Copland's ballet Appalachian Spring was commissioned by the Martha Graham Dance Company, and uses the Shaker melody in the scene where the newly-weds are blessed. The ballet was first performed in Washington DC in 1944, and my header photo is from the original production. Listen by launching the Radeo internet player from the right side-bar, or direct from the audio stream at 5.00pm on Sunday November 25. Convert to local time zones here. My programme of Simple Gifts is dedicated to Maurice Béjart who died on November 22, 2007, aged 80. Now read how Aaron Copland found 'tis the gift to be free. Hi, I enjoyed you post today on Simple Gifts, and look forward to your Future Radio show Sunday: http://theovergrownpath.blogspot.com/2007/11/simple-gifts-on-internet-radio.html. I’m copying Joel and Anne Azema, his partner, who I’ll be seeing after one of their concerts before Christmas. I’m confident they will enjoy your efforts very much.